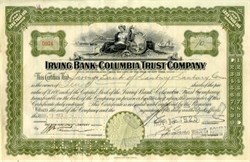 Beautifully engraved Certificate from the Irving Bank Columbia Trust Company issued in 1923. This historic document was printed by the American Banknote Company and has an ornate border around it with a vignette of an allegorical woman sitting on a lot of coins with old ships in the background. This item is hand signed by the company's officers and is over 85 years old. 1912 Name Change To Columbia-Knickerbocker Trust Co.
1923 Name Change To Irving Bank-Columbia Trust Co.
1981 Acquire By Merger Irving Bank Canada, Ltd.
1991 Acquire By Merger Bank of New York, F.S.B.